We see them everywhere we go- "Employees Only" signs, warning us of the areas off limits to the general public. Your basic standard sign is good enough for most places... but as we know, Walt Disney World isn't most places! Can you guess the location of the signs below? Share your guesses in the comment section! Where in The World would you find this scene? It's Saint Patrick's Day, so this seemed like a fitting time to talk about one of the shining stars in Downtown Disney: Raglan Road. I don't frequent Downtown Disney, but when I do go- I never miss a chance to spend some time in this establishment. A visit to Raglan Road Irish Pub is guaranteed to leave you full, smiling, and possibly tapping your feet. 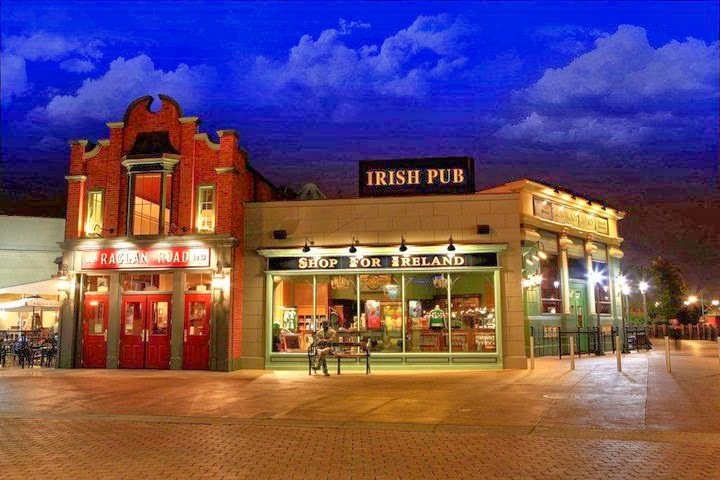 According to lore, the entire restaurant was built in Ireland, and shipped and assembled in Downtown Disney. I'm not sure of that story's veracity, but it does have an authentic feel when you're inside. The bar, which is separated from the dining space by a low divider, is made from enormous slabs of 130 year old Irish wood (or something like that, so the story goes!). The bar offers a full range of beverages, including many Irish and European beers along with American selections. Several different flights are available if you're interested in sampling a variety. The restaurant also features live entertainment on a regular basis, and you can catch Irish musicians and dancers on one of the stages in the dining room, seven days a week. As for the food, they have an extensive menu of humorously-named dishes, many of which are culturally authentic and not found elsewhere on property. The vegetarian selections are few, but those they do offer are tasty. Two of my favorite vegetarian selections are below: the Tart Art ( asparagus & goat cheese tart with garden peas, leeks, and arugula in lemon oil), and the Portobello Beauty. Granted, a portobello sandwich is a pretty standard vegetarian offering at any number of places, but this one is very fresh, well seasoned, and has interesting accompaniments. The restaurant (which is not owned by Disney) has an entertaining little website. Check it out at www.raglanroad.com. Peruse the offerings on any of the menus featured, and you'll get an idea of the interesting selections available. Whether you'e looking for a tried-and-true favorite or something more adventurous, you're bound to find something on this menu that piques your interest. 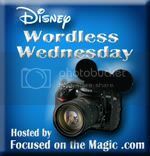 It's time for another round of Kill~Refurb~Marry with Mouse on the Mind and This Happy Place Blog! If you're not familiar with this game, it's the one where you choose three related things within a given theme: one you have no use for (Kill), one you'd like to revamp a bit (Refurb), and one you love (Marry). This month's theme is World Showcase Counter Service Restaurants! You're in World Showcase. With so many food choices, why go where the food is maybe only marginally as good as your local Chinese takeout? No decent vegetarian options, and it just barely edges out Liberty Inn for the bottom spot in the why-bother-eating-in-World-Showcase category. I hope that's not too harsh (and I really hate killing anything in my beloved World Showcase), but I always felt this was a wasted opportunity. Start over with this one. Yes, I know it just got through with a major refurb. But there's quite a bit wrong here that needs to be revisited. The food is great- I love the variety, I love everything I've tasted. I think the layout has been dumbed down, and its generic snaked queue does more harm than good. When the line splits, people get confused. There's a sort of no-person's-land where they aren't sure where to order, where to pay, or where to wait after they've paid but the food's not ready. People inevitably stack up near the registers, nobody is sure who's supposed to be where, and the CMs don't seemed concerned about supporting the process. It's a register cluster, and that never works. The old location was certainly too small- but it had charm, and it had a linear system that worked for me. Play along! Tell us about your ideas for Kill~Refurb~Marry in the comments. Better yet, write a post and participate in the blog hop! I received promotional items for participating in this campaign. All opinions are my own. Everyone can use a little bit of that Disney magic between visits, right? The #DisneySide @ Home campaign allowed us to do just that- and we had a blast! I applied to host a #DisneySide @ Home Celebration a few months back, through a campaign being run by Mom Select and Disney Parks. In exchange for receiving a party planning kit, I agreed to share my experience on my blog and social media channels. Half of the excitement was waiting for the party planning box to be delivered! As soon as it arrived, we got right to work planning all kinds of celebratory details for our #DisneySide @ Home event. The kit contained activity ideas, decorating supplies, giveaways for our guests, and more. My sister and her family came to town to help us celebrate. As I wrote about in this party planning post, the visit was a big deal! These people are not only our actual family, but they're our Disney family as well- and we had not all been together in the same place at the same time since a trip several years ago to Walt Disney World. 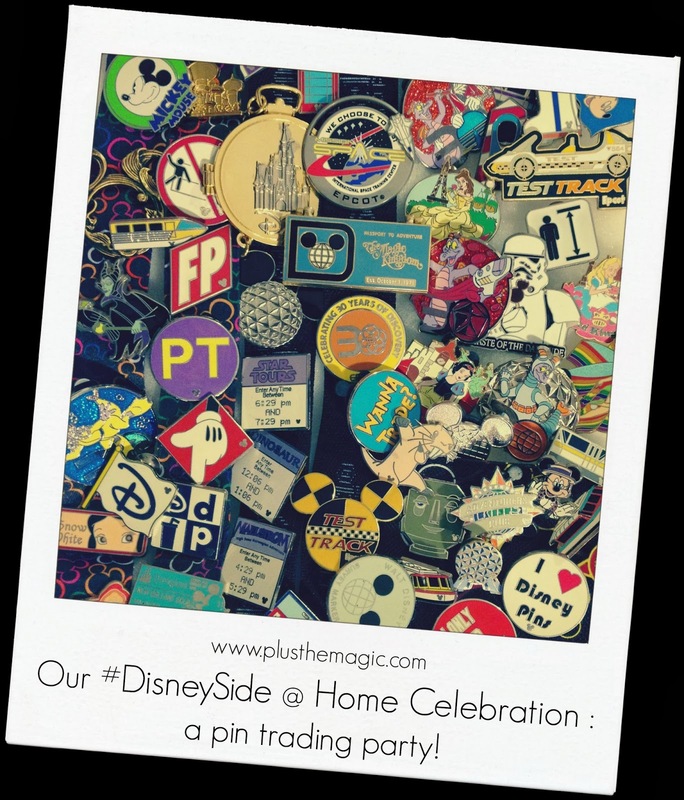 When deciding on the theme for our party, my mind kept going back to one of our favorite parts of any Disney vacation: pin trading. I knew I wanted to incorporate this special activity into our celebration. In addition to our main pin trading idea, we planned Disney-themed food, recreated a few special dishes and park/resort experiences, and played party games. We are big fans of pin trading in this family! My nieces and nephews are especially adept at it, having taken to it immediately during their first big whole-family trip. The excitement of the hunt, the interaction with Cast Members, and the satisfaction of building sets and collections are all part of the magic for us. Every one of us- young and old alike- gets into pin trading. In advance of our celebration, I ordered a few sets of authentic park pins to give out as prizes and to share with everyone for trading fun. My sister's family packed up their pins and brought their collections to town for the celebration. All sorts of trades were made during the party- a few sets were completed, and my sweet niece even made sure I ended up with a very special pin that I had my eye on from her collection. As I've shared previously, my daughter and I once had a very magical experience with a Cast Member creating silhouettes in the Magic Kingdom. 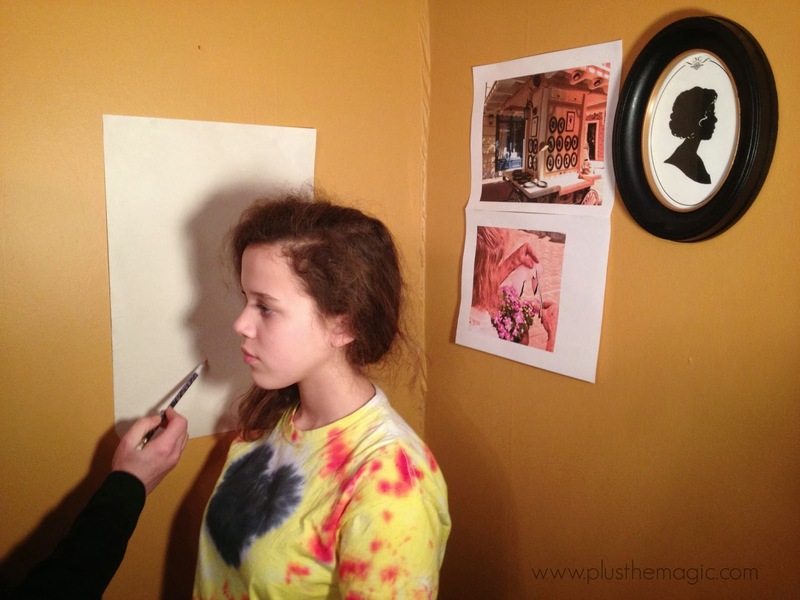 The silhouette booth was one of the special experiences we recreated for our party. Instead of cutting silhouettes, we traced them. A bright photography light shining on sketch paper allowed us to create silhouettes almost as special as those found on Main Street. 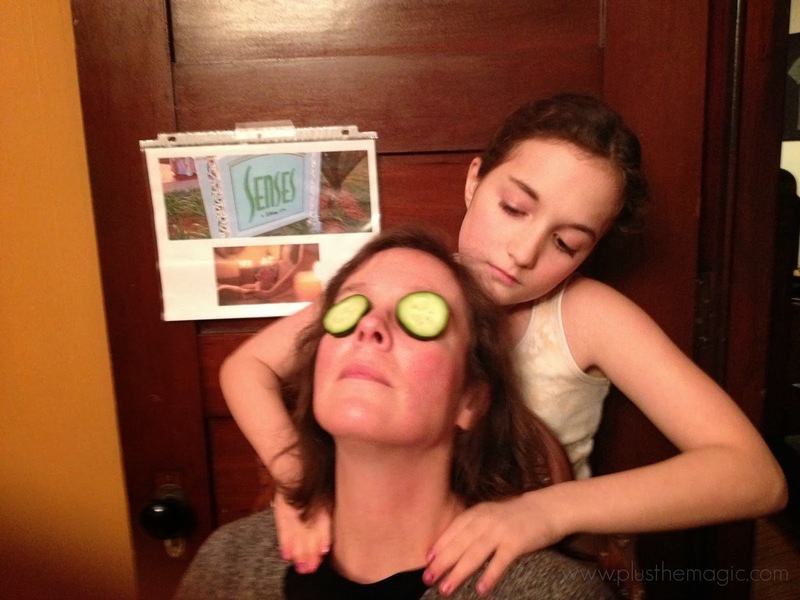 Another attempt at recreating a favorite was a visit to Senses Spa... at-home style! While my dining room was far from a duplicate of this luxury indulgence, a little imagination combined with a great masseuse-in-training really did provide a relaxing break from the day's excitement. We also made some Mickey pretzels and rice krispie treats...gluten-free style. One of our guests was gluten-free, so I made gf versions of pretzels and krispie treats. The results were...mixed. Everyone pretty much agreed that these treats looked a lot better than they tasted. Both were fine immediately after they were made, but when revisited later in the party- rock hard. A set of Hanes t-shirts was included in our party planning package, so I attempted a Mickey head tie dye project I found online. Once again, mixed results. I suppose they weren't bad for my first attempt at tie dying in decades, but the Mickey heads on some of the shirts came out looking more like hearts than heads. Fun, though- and great quality shirts. Our main game was Disney Bingo. These cards have great photos, divided into categories such as parks, characters, attractions, and resorts. As fun as these photos were to peruse, I'm not sure the design was right for an actual game of bingo. There wasn't a whole lot of variety between the cards, so due either to the card design or a massive coincidence- 5 out of 6 players called Bingo all on the same call...twice. Fortunately, we had lots of little giveaways to award all the prize winners! All in all, our #DisneySide @ Home Celebration was a great success! We had a fantastic time reliving some of our past park experiences, and planning for new ones to come. Special thanks to Mom Select and Disney Parks, for including me in this campaign! Everyone is encouraged to plan their own #DisneySide @ Home Celebration- visit disneysidecelebrations.com for ideas!